Course Description: Students will grow in their ability to speak, write, read and listen and understand Spanish. Students will study vocabulary, grammar and culture while working on these skills. Grammar covered in this course includes: preterit, imperfect, regular and irregular forms, present, future, direct object and indirect object pronouns, and correct usage. This is course is two in one. It’s based on GVL’s Spanish 3 course. The vocabulary and many activities come from there. Interspersed is a grammar course based on John Turner’s All the Spanish Grammar You Really Need to Know (license). When you aren’t receiving a score for something, use it as a learning opportunity. You may not know all the answers (so I didn’t have you score it), but you can learn from your mistakes and come away knowing all the answers. You should get in the habit of reading over your vocabulary each day before you start your lesson. You should get in the habit as well of writing out your vocabulary and writing out verb conjugations and such. It’s one thing to think a word, it’s another to actually produce it. 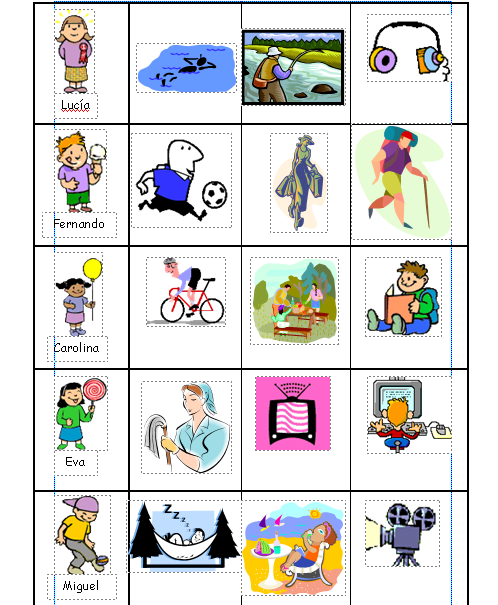 Read about consonants and vowels in Spanish and complete the exercise. Read about spoken and written accents in Spanish and complete the exercise. Work with the flashcards. Make sure you listen to the numbers and identify them. Can you spell them? Try to fill in the blanks in both sets. Review the months. Make sure you practice spelling. Review the days and seasons. You could try a test. Read over more conjugations. Write some out for practice. Can you fill in the blanks with the correct verb and form? Review stem changing verbs in the present tense. Take the quiz (10 questions) and record your score out of 5, a half a point for each correct answer. Spelling counts! Review more stem changing verbs. Take the quiz and record your score as above. Fill in the blanks with the correct form of the verbs. Take a quiz and record your score out of 5. Score half a point for each correct answer. Spelling counts. Take a quiz and record your score, same as above. Continue to review preterit forms. Review the preterite for ser, dar, ir, hacer. Take a quiz and record your score out of 5 (as usual). Review the preterite. Write out some conjugations without looking and then check your spelling. Fill in the blanks with the correct form of the preterite. What can you read of this activity? (*)Read over your vocabulary list. Listen to the vocabulary and practice. Also, read the paragraph on the page. Then put your mouse on it to see the translation. How much could you understand on your own? Review the page on indefinite articles, the contraction of del and al, and negation. Review your vocabulary for this unit. Review this grammar page on adjectives and compound nouns and complete the exercise. Review telling time and common expressions with tener. Translate five sentences from the top section of this review page. Check and correct your answers. Watch this video on the uses of ser and estar. Choose the correct verb. (Do both sections. Look at the feedback after each choice. Watch this video on directions. Taking notes might come in handy very soon! Enter the correct form of ser. Choose the correct answer, ser/estar. Write a 15 sentence dialog asking for and receiving directions. Use correct spelling and verb conjugations. Correct your 15 sentence dialog asking for and receiving directions if need be. You will receive points for spelling and usage! Practice reading your dialog out loud. You will have to play both parts of the dialog. When you are ready, read it out loud to an audience. Receive a score for your presentation. Score up to 1 points for each sentence (out of 15) if you followed the directions. Score up to 5 points for accuracy. Parent, ask your child to show you were to find some of the words or phrases in the learning material for you to check on the accuracy of the spelling. Use this picture to describe the locations of two things. Use the vocabulary list and ser and estar. Write three sentences for each. Receive a score for your sentences. Score up to 3 points for each sentence (out of 18) if you followed the directions and wrote in complete sentences. Score up to 7 points for accuracy. Parent ask your child to show you were to find some of the words or phrases in the learning material for you to check on the accuracy of the spelling. Use this picture to describe the locations of two other things. (Yes, it’s the same picture.) Use the vocabulary list and ser and estar. Write three sentences for each. Review the vocabulary from Day 14. Read the page on questions and complete the exercise. Score up to two points for each sentence. Check spelling and accents! For three more points, come up with examples where Spanish uses the definite article and English doesn’t and/or when English uses the indefinite article and Spanish doesn’t. I hope you learned your vocabulary! You may review the words before you take the test, but then you need to put away all notes and close all other windows/tabs, etc. on your computer. If you cheat now, it will just show later when you don’t know the words! Take a vocabulary test on the words from Day 14. (*)Read over the vocabulary list of professions. Work on learning them. You might want to copy them since many are easy to remember but are harder to spell exactly. You’ll need to be able to spell these! Try some vocabulary activities to practice the words. Some will help you practice spelling. (*)Read over the vocabulary list of technology. Work on learning this vocabulary and the professions. Answer the question at the bottom of the page in complete sentences. You need to be learning your vocabulary. Make sure you can spell the professions! Record 5 points if you answered the question in a complete sentence (or two) stating how you like to communicate with your friends and why. Watch this video on the future tense. What are two ways the future is formed? When would you use each form? Practice writing out the future tense conjugation. Fill in the blanks with the future tense. Check your answers. *Print out this blank verb sheet. Fill in the present and future of a verb that you know. Fill in the preterit as well. Hold onto this. Fill in the blanks with the correct form of the future tense. Read this poem as best you can. You can click on words for pictures of their meanings. Fill in the blanks with the future tense. Read the translation of the poem. Now click on the poem link in number one above and read the poem one more time in Spanish. Go over these university vocabulary words. You are going to write 10 sentences talking about your future or the future. You must include profession and/or technology vocabulary from this unit. You must also use the future tense! You can finish this on Day 35. Make sure your spelling and conjugations accurate! Finish your sentences on the future. Practice reading the out loud. Read them to an audience and receive a score. Score up to 1 points for each sentence (out of 10) if you followed the directions. Watch episode 1 of Destinos and listen. Read the page on adverbs and complete the exercise. Make sure you know the vocabulary from this unit. Can you spell the professions? Read the page on negative and indefinite words and complete the exercises. Read the page on demonstratives and complete the exercise. Your test is on Day 41.
Review stem-changing verbs and complete the exercise. Score half a point each for the answers in number 1. That’s 5 points. Count your correct answers for number 2. There are forty. Take your professions test. NOTE! After each one, check your own work! It will give you the correct answer. You may write either the masculine or the feminine. If you spelled it perfectly, including “el” or “la,” then you get one point. You get no points for a word not spelled perfectly. (*)Read over your new vocabulary and practice it. Writing it out is a good way to help get it in your brain and to learn the correct spelling. Read this short passage with your new vocabulary in mind. (*)Answer the following questions the best you can from listening to these speakers talk about their first airplane ride. Watch this video on the conditional verb form. Here’s a chart to help you. Write out the conjugation of the conditional verb form for comer, vivir and hablar. Check your work. Read over this page and then write out the conditional conjugation of an irregular ir and er verb. Portfolio/records: In your portfolio you should include a couple of your assignments from this quarter. You could also take a screen shots of different quizzes/exercises. Keep your written work. Choose things that are neat and well kept. Look at and listen to the lesson on the conditional. At the bottom of it click on the worksheet and complete. Type in your answer and then click on the ? to see the correct answer. Then go back to the lesson page and click on the quiz at the bottom. Take the quiz and check your answers. Read this poem as best you can. Use the links within the poem for vocabulary help. Now go back and read the poem out loud as best you can. Give yourself 1 extra credit point if you read it to an audience. Fill in the conditional forms of the verbs. Practice your vocabulary. Have you written it out to practice spelling? Write 12 sentences about a Spanish-speaking country you want to visit. Talk about how you would travel there and while you are in the country and what you would like to see and do there. Use travel vocabulary and the conditional tense. You have three days to work on this. Look up the country you are choosing and learn a little about it for inspiration. You will finish and present on Day 51. Write 12 sentences about a Spanish-speaking country you want to visit. Talk about how you would travel there and while you are in the country and what you would like to see and do there. Use travel vocabulary and the conditional tense. You have one more day to work on this. Make sure to use correct spelling and conjugations. Finish writing 12 sentences about a Spanish-speaking country you want to visit. Talk about how you would travel there and while you are in the country and what you would like to see and do there. Use travel vocabulary and the conditional tense. Present your report to an audience and receive a score. Score up to 1 points for each sentence (out of 12) if you followed the directions. Read about future tense with ir a and complete the exercise on the page. Read about personal ‘a’ and complete the exercise. Read about conocer and saber and complete the exercise. Read about relative pronouns and complete the exercises. Read about possessives and complete the exercise. Read the paragraph out loud in Spanish. Watch episode 2 of Destinos. Take a vocabulary quiz on transportation. Take out your verb sheet and fill in the conditional conjugations. (*)Look over your new vocabulary. Did you copy the words to practice spelling? Read this biography of Picasso as best you can and answer the questions. Watch the video on por vs. para. Read more on por vs. para. (*)Look at the por chart. (*)Look at the para chart. Watch the lesson on por vs. para. List three uses of por and three uses of para. Record 6 points for 6 uses. Read this story and point your mouse at each red por or para and read about its usage. Fill in the blanks. There’s no score for this. It will tell you the correct answer after you fill in each box. Write twelve sentences in which you interview a Spanish-speaking artist. Remember that the pronoun comes after the verb when asking a question. Por is used to say who created a piece of art. Use vocabulary and grammar from this unit. You will present on Day 67. Choose an artist. You’ll have to do a little research. Pick a piece of artwork/music/etc. to ask about. Maybe these sites will give you inspiration. Finish your twelve sentences in which you interview a Spanish-speaking artist. Remember that the pronoun comes after the verb when asking a question. Por is used to say who created a piece of art. Use vocabulary and grammar from this unit. Make sure it’s correct and practice reading it. Present your interview to an audience. Review ser and estar and complete the exercise. Review your vocabulary from Day 59. Can you spell it? Review your art vocabulary for a test. Read about and practice the infinitive and gerunds. Study your vocabulary. Make sure you can spell the words! Watch the next episode of Destinos. (*)Go over the vocabulary for this unit. Review the vocabulary for this unit. Listen to some of the vocabulary. Watch this lesson on the present perfect tense. Use this chart to help you. Read over the lesson on the present perfect. Take the quiz. Complete numbers 1-20 (parts A and B). Look at your chart from Day 75 and listen to and read this list of irregular conjugations. (*)Follow the directions and write the correct form of the verb. Spelling counts! Complete all three sections, filling in the correct form of the verb. Follow the directions. Listen to all of the videos. Translate one of the paragraphs on this sheet. Be careful to translate the verb tenses accurately. You may use an online dictionary to look up individual words, but don’t use Google translate for phrases or sentences. Parent: if their translation sounds all weird, they used Google translate! Record 5 points for completing this assignment. *Print out this blank verb sheet. Fill it in for the verb reir, to laugh. How much can you fill in? Make sure you have the present, future, preterite, present perfect, conditional and gerund. Check your work. Correct any mistakes. Spelling counts! Review the preterite and complete the exercise. Read the lesson on large numbers and complete the exercises. Review dates and weather and complete the exercises. Read the lesson on both, all and every and complete the exercises. Score up to 10 points for section A. Score up to 5 points for each sentence. Take a point off for each misspelling or incorrect word. Record your score out 25.
Review your vocabulary from all units. Your test is on Day 90. (*)Work on learning the vocabulary for this unit. (*)Review colors and how to use them in descriptions. Listen to the commercial. What can you understand? Write sentences describing what you are wearing. Use colors (light/dark) and names of items of clothing. Write at least three sentences. Record up to 6 points for 3 sentences which each included an item of clothing and a color. Browse the online clothing store and read the labels. Can you read the menu and navigate the store? Make sure you are learning your vocabulary every day. Can you spell it? Make sure you know your clothing vocabulary. Give a try at reading on this Spanish wedding fashion website. You can also click around. Listen to the speakers talk about clothing. (*)Answer the questions. Do you know what a direct object is? Practice using direct object pronouns. Fill in the correct direct object pronoun. Do you know what an indirect object is? Practice with the indirect object pronoun. Learn about using direct and indirect object pronouns in Spanish. Practice with the direct and indirect object pronouns. Complete the exercises on the direct and indirect objects. one, Record your score out of 10.
three, Record your score out of 10. Take the quiz on direct and indirect object pronouns. Note your score out of 20. You may write up to five sentences using two object pronouns in each. For each sentence you can add a point to your score. Record your total out of 20. (*)Here are vocabulary review sheets. Write 12 sentences describing two new outfits that you have designed. You can finish this on Day 102 and present it. Make sure you are using correct spelling and grammar. Finish your twelve sentences in which you describe clothing. Watch episode seven of Destinos. Make sure you know your clothing vocabulary for a test on Day 105. Can you spell it? Watch episode eight of Destinos. Take the vocabulary test. If you can’t type Spanish letters, you can print this out and take it on paper. Record your score out of 15. Spelling counts! If it’s not spelled correctly, then it’s incorrect. (*)Start learning your new vocabulary, pastimes. Make sure you know and can spell the days of the week. Click on spell when you are ready. Make sure to practice your spelling! We’re going to review and practice the preterit. Look over the forms of the preterit and pay attention to the irregular forms. Watch this video on irregular preterite verbs. Complete the exercise on irregular preterite forms. Watch this video on the imperfect of regular and irregular verbs. (*)Complete this worksheet on the imperfect. Check your answers. Score 1 point for each correct verb form (out of 10). Score 1 point for each correct (including spelling) verb in the translation plus 1 point for the accuracy of the rest of the sentence (out of 16). Watch the video on the preterite vs. the imperfect. Are you practicing your vocabulary? Lazy bones learn no Spanish. I’m sure that’s an old saying from somewhere. (*)Read over this chart of usage of the preterite and the imperfect. You can also use this presentation to remind you. Fill in the blanks with the correct verb forms. Check your answers. Correct anything wrong and work to understand any mistakes. Try the exercise using both the preterite. (*)Complete this worksheet by translating the sentences. You will decide which verb form to use. Remember: The imperfect is always used with weather and age. Complete the exercise by choosing the correct verb form. Write three sentences about what Lucia does and doesn’t do. What are her hobbies? Use the imperfect and preterite. Use the vocabulary. Record up to 2 points for each sentence for using the imperfect and preterite in each sentence, plus one point for a correctly spelled vocab word. Write three sentences about what Fernando does and doesn’t do. What are her hobbies? Use the imperfect and preterite. Use the vocabulary. Write three sentences about what Carolina does and doesn’t do. What are her hobbies? Use the imperfect and preterite. Write three sentences about what Eva does and doesn’t do. What are her hobbies? Use the imperfect and preterite. Complete the exercises by writing the correct verb form. Write three sentences about what Miguel does and doesn’t do. What are her hobbies? Use the imperfect and preterite. Listen and list a favorite activity for each. Record your score out of 6. One point for each person you can identify a favorite activity for. Study your vocabulary for the unit. Can you spell it? Read the lesson on the imperfect and complete the exercise. There are 18 blanks. Record your score out of 9, a half point each. Through day 130 you’ll be doing these grammar reviews while learning your new vocabulary. *Here’s your new vocabulary to be working on, la comida. Read the lesson on the imperfect vs. the preterite and complete this exercise. There are 18 answers. Record your score out of 9, a half point each. *Be working on your new vocabulary, la comida. Read the lesson on using hace with time expressions and answer the questions. Be working on your new vocabulary, la comida. Read the lesson on ordinals and complete the exercise. Compete the assessment. Score up to 1 point for each numbered exercise (9 for part 1, 7 for part 2). For an extra credit point, choose one sentence to translate. If you are correct, add one point to your score. Listen to some food vocabulary. *Here are food words to review. Here’s vocabulary review for fruit and vegetables. Here’s another food practice page. This one has a lot more words. Here’s another food vocabulary review page. Write ten sentences each using a verb from your new vocabulary list. Use other vocabulary in each sentence as well. You must use at least two vocabulary words in each sentence. Score 1 point for each sentence with at least two vocabulary words in it. Score another point for any sentence with three or more vocabulary words in it, up to two extra points. Watch this video and answer the (*)questions. Watch these videos on when to use the subjunctive. Read this lesson about the subjunctive. The font is weird on this but try the exercise. You can use the lesson if you need it. Take the quiz on the subjunctive. Write the subjunctive form of the verbs. Record your score out of 15, a half point each. Record your score out of 12, a half point each. Make sure you know how to spell your food vocabulary words. There are 26 blanks. Record your score out of 13, a half point each. (*)Answer these questions as you listen. Here’s a little subjunctive practice. Write 10 sentence recipe using the subjunctive. Present your recipe to an audience. Score up to 5 points for accuracy. Parent, ask your child to show you were to find some of the words or phrases (food vocabulary or verbs in the subjunctive) in the learning material for you to check on the accuracy of the spelling. You can have 10 extra credit points if you make a Spanish-speaking recipe video. Email it to us and we can post it in our hall of fame. Record your score out of 18. Study your new vocabulary list (It’s the list that starts with “to chop”). You will have to write out the vocabulary. It’s only right if it’s spelled correctly. *Here are some review restaurant words. Cover the Spanish and try to write the words in Spanish. How did you do? Correct your mistakes. *Study your new restaurant vocabulary words. Read these facts about chocolate and share a few with someone (in English). Here is a recipe site in Spanish. Choose something to try. Watch this video on formal commands. Read the sheet on formal commands. Make sure you practice by writing some out. Read about the exceptions to the rule. Review if necessary and then click to generate a quiz for practice. Take the quiz on formal commands. Score a half point for each correct answer. Score a half a point for each correct answer. Watch the video on formal commands in a restaurant. Write a dialog between a waiter and a customer at a restaurant. Write at least twelve sentences. Use your vocabulary and formal commands. Score up 24 points for your sentences if you followed the directions. Read your sentences allowed. Score up to 6 more points for fluency. Study your vocabulary for the unit and make sure you can spell the new vocabulary. Score one point for each correctly spelled answer. Cover up the Spanish and try to write the words. What do you already know? Check your work and fix mistakes. Learn your new chore vocabulary. Listen to these people talk about their homes. Listen without looking at the words and write down notes about their homes. Listen again and read along. Were you correct? Watch the video lesson on informal commands. Take notes. Read the lesson and then click to take the practice quiz. Read the lesson and take the practice quiz. (*)Try the worksheet on informal commands. Check your answers at the bottom of the page. Read the explanation about pronouns and commands. Take the positive and negative commands quiz. Read the part 1 of the story of Cinderella. Read through it with a dictionary and work on figuring it out (along with your knowledge of the story). Then read through it out loud. Read the part 2 of the story of Cinderella. Read the part 3 of the story of Cinderella. Read the part 4 of the story of Cinderella. Read the part 5 of the story of Cinderella. Use informal commands as you tell the story of chores around your home. Write twelve sentences. Record up to 2 points for each sentence if you followed the directions. Record up to 6 points for 6 words spelled/used correctly. Show them to your parent in the learning material. Record up to 5 points for fluency when you read it to your audience. On Day 180 you will have a vocabulary final exam. It will be multiple choice. You will also present a monologue. Write a story that you will tell. My suggestion is to write about your week. It should be three minutes long. It should use vocabulary from the course and the verb forms from the course. When you write it, underline words/forms you use from the course, so that they can be checked. Study your vocabulary and prepare your talk. The vocabulary final is worth 50 points. Your talk is worth 50 points: 10 points for fluency (practice! ), 10 points for correctness (checked against course material for spelling/usage), 30 points for following the directions (10 points for each minute). You can read about this girl’s chores in Guatamala. Take a tour of Alhambra, a palace in Granada, Spain. Maybe you need to rest your brain a bit. Watch an episode of Destinos. 30 points for a three minute story using words and verb forms from the course. Congratulations on finishing Spanish 3! Figure out your total grade for the quarter and for the course. Record it on your transcript and create a course record.